Picture Gallery copies the format of a print room wallpaper. The trend for print rooms was said to have started in Paris during the 1720s, becoming fashionable in England by the 1750s. Print room walls were adorned with actual prints that were cut out and pasted on the wall, then usually outlined or framed with wallpaper borders and flourishes. Wallpaper manufacturers picked up on this trend and started printing trompe l’oeil designs that copied the look of framed prints. Picture Gallery replaces the antique prints with contemporary drawings of historic events and places in New York City. 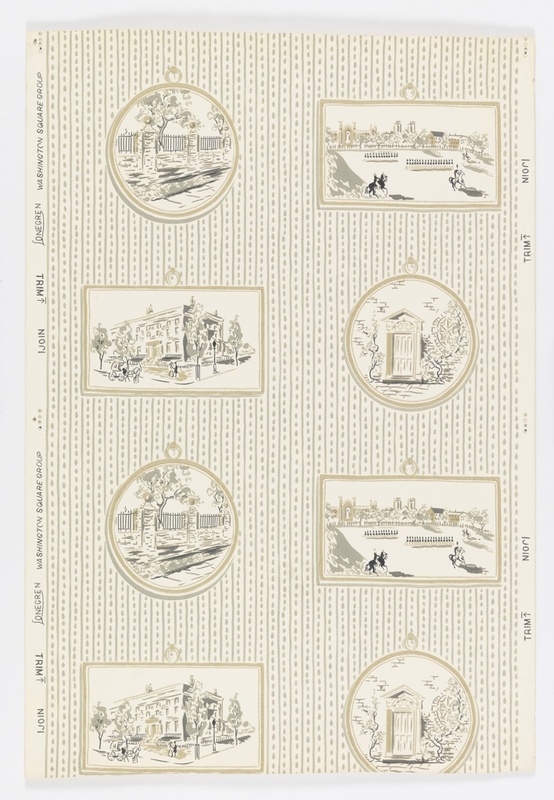 The alternating round and rectangular frames contain scenes of landmarks located around Washington Square Park. I was able to find original designs for two of the views while the remaining two are a little more generic and difficult to pinpoint. The one rectangular view copies the “Seventh Regiment on Review,” painted in 1851 by Otto Boetticher, which took place in Washington Square Park. The other rectangular view shows the former Rhinelander Mansion which was located on Washington Square North and Fifth Avenue. The mansion remained until 1922 when it was refaced and became an apartment complex, later being demolished in 1951. Photograph of Rhinelander Mansion, Museum of the City of New York. Beryl was an interior designer by trade and founder of Intramural, Inc. She built her career on historic elegance where she combined traditional and modern elements to pleasing effect. She frequently visited museums and archives to find the right details for her projects. And I am happy to report that Ms. Austrian did her homework at the Cooper Union Museum studying the wallpaper collection when working on this design. The framework was inspired by a wallpaper now in the Cooper Hewitt, Smithsonian Design Museum collection. Again – you’ve taken an arcane subject and made it relevant! Congratulations on your image research… and archive sleuthing; nudging us toward more closely examining an object we’d ordinarily not give a second glance.